General Admission; arrive early to be sure your whole party can sit together! To purchase tickets visit here.org or call 212-352-3101. Dinae Anderson-Ruano, Jordan Fleming, and Veronica Lowry in Embodi(ED). Photo by Ashley Marinaccio. BOTTOM LINE: Girl Be Heard cultivates young feminist activists to battle the multi-billion dollar weight loss industry and the eating disorder epidemic in the United States. Since 2008, Girl Be Heard has been empowering young women to create theater about topics affecting women like them nationally and globally. Their newest production, Embodi(ED), is currently making its world premiere at HERE. 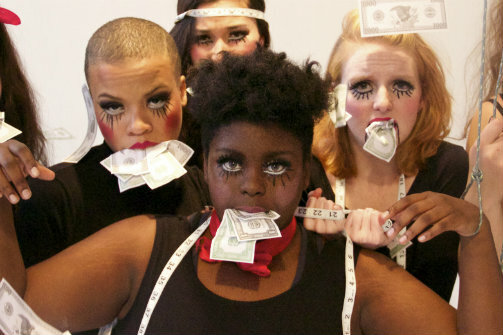 Embodi(ED) (the “ED” representing a common abbreviation for "eating disorder") tackles the intersection between capitalism, female beauty standards in the US, and the health epidemics that result. The ensemble of young women, all 15 to 25 years old, wrote and devised a series of vignettes based on personal experiences and research on these topics. A loose essay structure holds the whole work together: First, we are introduced to the pressures society puts on women (and that women and their loved ones enforce on each other) to be “beautiful” and “healthy”…in other words, thin. Second, we see the results of these toxic messages purporting unattainable ideals in accounts of young women starving themselves. In the third and final section, the company presents alternative ways all women can measure their worth and value, while discussing their own experiences in recovery from ED. The vignettes are as diverse as the performer-writers who created them, but are linked by their common grappling with womanhood and feminine beauty in a capitalist, misogynistic society. Each vignette harnesses each writer’s strengths, including poetry, song, various forms of dance, and more traditional scenes and monologues. I found the dance segments particularly compelling: Beautifully executed by the company and smartly choreographed by Ian Stewart, the dance sections predominantly fuse classical ballet and modern techniques (with hints of May Day pole dances, musical theater styles, and country thrown in occasionally), providing a key juxtaposition between traditional images of “feminine perfection” and expressionistic images of the turmoil these “perfectionist” pressures cause. In both the piece’s textual structure and visual design, we often feel inundated with multiple narratives at once, as performers overlap text, and as projections (designed by Quentin Madia) overlap images and sound created live onstage. This cacophony seems to mimic the media’s constant streaming into our psyche, or perhaps a never-ending stream of self-conscious anxieties. The multitude of voices all at once also serves as a reminder of the millions of women who are represented in all of these overlapping narratives. Scenic designer Rebecca Kleinman echoes these chaotic moments with thick, squiggly lines that radiate out from center stage, like beams of electricity shooting out of a nucleus, giving the space a feeling of constant energy. Kleinman’s nonliteral design also allows the more intimate moments in the evening to shine on their own, and for Mitchell Ost’s smart lighting design to shape specificity into Embodi(ED)’s constantly-changing world. By far the most important result of this process has less to do with the performance itself and everything to do with the young women who created it: during the post-show talkback, these women openly and honestly shared their experiences working on the piece, revealing how many of the stories told were based on their own experiences with eating disorders. In a world where women are too often silenced or not taken seriously when articulating their own experiences and opinions, here is a company of women boldly and unapologetically giving voice to issues that matter most to them. After their time with Girl Be Heard, I have the feeling these young women would be hard-pressed to let anyone try to silence them in the future. Girl Be Heard is cultivating a new generation of strong women and social activists, and that is something to be celebrated. Embodi(ED) is written and performed by Girl Be Heard members Dinae Anderson-Ruano, Maria Diez, Jordan Fleming, Allison Flom, Jaida Foreman, Me’Khai Lewis, Veronica Lowry, Katie Looney, Ashleigh Chrisena Ricci, Megan Sideropoulos, Madeline Shaffer, Nina Tandilashvili, and Annalise Wedemeyer. Embodi(ED) is directed by Ashley Marinaccio. Choreography is by Ian Stewart, with Madeline Shaffer, Megan Sideropoulos, and Ashleigh Crisena Ricci. Set Design is by Rebecca Kleinman. Lighting Design is by Mitchell Ost. Media and Projection Design is by Quentin Madia. Costume Design and Art are by Ileany Fields. Assistant Direction is by Tiff Roma. Dramaturgy is by Jen Thatcher. Stage Manager is Cristin Gordon.